Cage will be done tomorrow! Just have to put on the perspex! I can't wait to see it! I'm so happy that you were determined enough to come up with a suitable, alternative, and cheaper cage to make! Your guinea pigs will appreciate it so much! How do you make sure your lower cage (in a stacked cage) gets enough light? Doesn't light diffuse though? Won't it evenly travel to all levels? 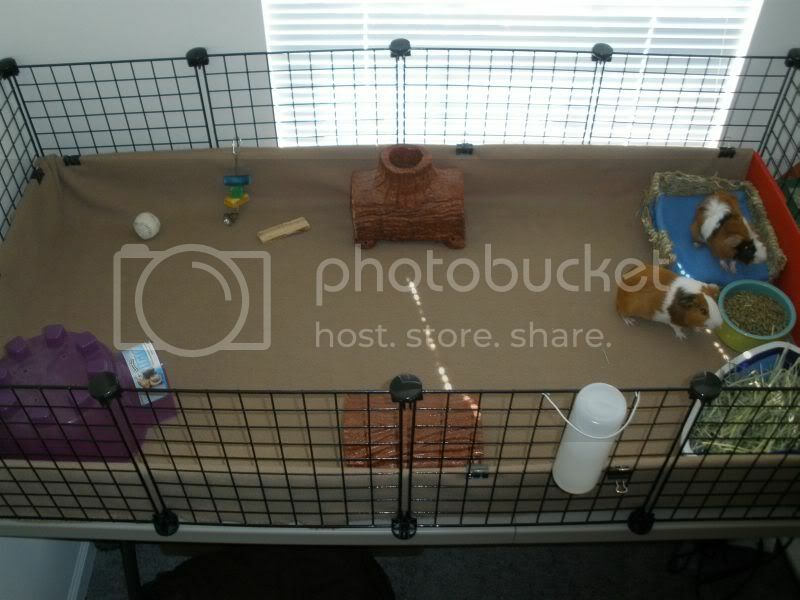 I really want to see this cage because I am still not convinced wooden cages can work after my moldy experience with BB's old hutch! But if these shelf cages actually work and provide enough space, they could be a great alternative. I took the picture lob sided, the cage doesn't look like that really lol! The perspex, I can't remember exactly how tall it is, but I made it so I can just about put my arm in there to feed them and stuff. Then when I need to clean or get them out, the perspex slides out. So it is very easy to clean. Each floor is 5ftx2ft, so they have more then the recommended amount for one pig (they can have a floor each if they want lol!). My only suggestion would be maybe a water bottle on each floor? Okay, I guess the pic made it look a little smaller, or maybe your pigs are big! Haha, sounds super functional! That would be my suggestion too. Don't want them to die of thirst three floors up! :). Great cage. You'll start to see a differenc in them. Ya they get a load of hay heaped in a corner, but I literally had just put them in there when I snapped this picture haha. They always have hay available. Normally they have two water bottles, right now they only have one because we are trying out a way of holding them and seeing if it works out. It isn't too bad anyway because only 2 have dared to venture the 2nd storey so far lol! Oh and just wanted to add I am by no means finished with this cage, I'm hoping to make a few cages and add a few things. 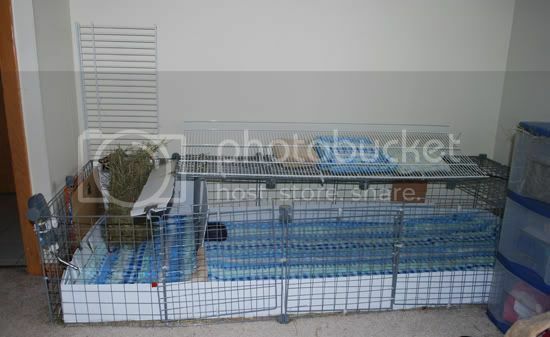 I want to make a small area for hay on each floor, and when they get used to the cage. Each floor will serve a different purpose. Bottom floor ''Kitchen'', 2nd floor ''bedroom'' (loads of fleece and cuddly things) 3rd floor ''play area'', I will have almost nothing up there, so they can have a proper run around. I would make sure that there is hay and water on each floor. I love how much effort you put into this cage! It's a very interesting (and pretty) approach - thanks for sharing! It really is an amazing structure. I only mentioned the water on each floor because when one of them wants to hide out from the other two, it's nice if he can have a little drink! On the very bottom floor, they have hay in a cardboard tube thingy and in a little box and on the rest of the floors, just big heaps. Imma get another water bottle as well, and put one on every floor. Last night I managed to get them to go to all the levels! 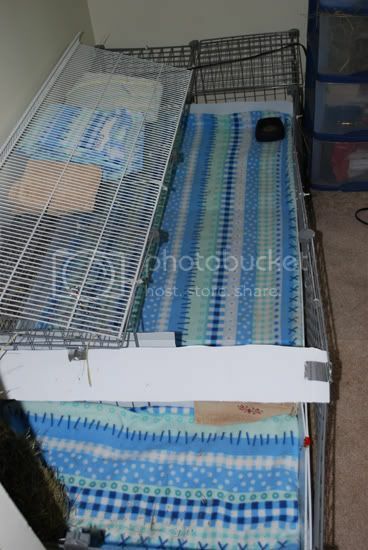 Here's my cage (obviously missing hideys -- don't worry, they have them!). 2x4ish + 2x1ish hay area. I have since taken out the hay rack and have just provided big piles of loose hay. I think they eat more that way. I can't wait until I move this summer. I'll have room to upgrade to a 2x6, so the boys can have a 2x5 grid area to run around in. The cage just seems a little cramped to me with two adolescent boars, but there's just no room to expand right now. Here is my contribution, its a 2x4. I took this just now, after a nice fresh cleaning that the boys are enjoying. And of course the first thing they go to is the food. I was curious where I can find those nice little cozy beds and hideys that a lot of people seem to have. Could anyone point me in the right direction? Id love to get one for my little guys.